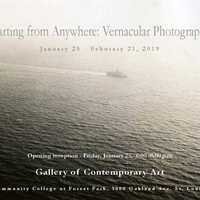 Starting from Anywhere: Vernacular Photography is an exhibition of photographs from the collections of STLCC faculty members David Hanlon, Jamie Kreher, and David Moore. Vernacular photography is a genre that includes personal snapshots, family albums, school portraits, travel or souvenir images, commercial portraiture, and occupational photographs. Most of the time the images are made by amateurs or photographers who aren’t well known. They can be unintentionally artistic in their depictions of everyday life. Vernacular photographs also reveal the relationship between culture, history, and photography. Visitors to the gallery will be able to create their own vernacular photographs from their smart phones during the opening reception and at various times throughout the exhibition.